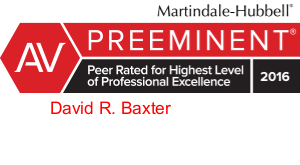 The majority of Dave Baxter's practice revolves around the aviation industry. Dave Baxter joined Gallagher Sharp in 2015. For over 30 years, the majority of his practice has revolved around the aviation industry. He defends Part 121 carriers, Part 135 operators and Part 91 aircraft owners, airports, and pilots of all ratings in personal injury, wrongful death, property damage, product liability, premises liability, cargo, and regulatory litigation. He has appeared in state, federal and appellate courts (including multidistrict and class-action proceedings), as well as before the National Transportation Safety Board and other regulatory agencies. He also counsels and represents foreign and domestic insurance carriers in aviation-related insurance litigation. Dave is a frequent speaker on the interrelationship of Michigan Law and Federal Aviation Regulations concerning UAV (Drones) and recently testified before the Michigan House of Representatives Committee on Criminal Justice regarding the Operations of Drones and Airspace Limitations by Law Enforcement and Private Citizens.